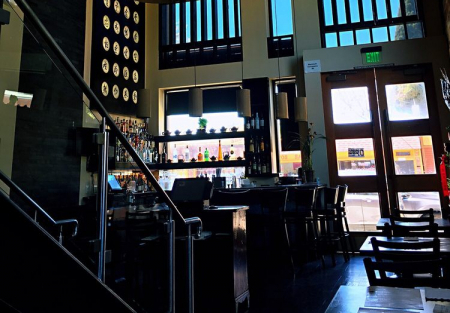 Upscale pho restaurants with two floors, modern decor, and a bar near the front. It's located near the end of College/Rockridge so street parking is the way to go. This restaurant is beautifully decorated with high ceiling and there is even an upstairs area for private parties. The interior is magnificent with great ambiance. The restaurant comes with a Coveted type 47 hard liquor license. There is a bar area that serves cocktails from beer, wine and lychee nut martini. Some of the equipment include 24.5 feet type 1 hood, steamer combo, solar power, 5 wok stove, counter expediter, 2 prep table, camera system, ac system, walk in and freezer, heater back patio and much more! There is just something about a neighborhood that is near a thriving university. It creates an energy that you just can't describe. From Crepevine, Trader Joe's, bars, Thai restaurant, and many shops surrounding Rockridge.